New Page Books, 9781601631732, 256pp. What is the Government not telling us? 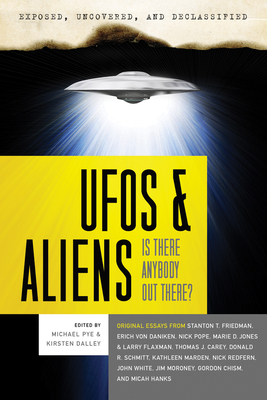 Exposed, Uncovered, and Declassified: UFOs & Aliens strives to address all of these questions--and more--by covering new evidence of famous sightings and contact with aliens, and uncovering classified files from world-class collections and archives--all courtesy of the world's leading experts on modern ufology. Nuclear physicist and world-renowned UFO expert Stanton T. Friedman discusses how close we really are to interstellar travel. Erich von Daniken, father of the ancient astronaut theory, discusses the possibility and evidence of ancient hybrid creatures created by visiting god-like aliens. Nick Pope, former member of the British Ministry of Defence, covers the latest UFO documents released by the UK's National Archives, including such fascinating information as: what Churchill knew, why the documents are being released now, what's in them, and what's still being withheld. Donald R. Schmitt, the former co-director of the J. Allen Hynek Center for UFO Studies, takes on the aftermath of the Roswell incident, discussing in detail the initial stages of the government's cover-up attempts. Air Force veteran Thomas J. Carey chronicles the military's attempts to intimidate people into not telling their stories about what they have seen with their own eyes. The niece of Betty and Barney Hill, Kathleen Marden, gives a short history of cases of alien abduction, many which continue to baffle the American public and UFO investigators alike. Nick Redfern provides a fresh take on the famous 1953 UFO crash in Kingman, Arizona, and explores its possible connection to a government program to reverse-engineer alien spacecraft. Something is out there, and Exposed, Uncovered, and Declassified: UFOs & Aliens will help us find out exactly what--or who--it is. Michael Pye has been an acquisitions editor for New Page Books since 2003. He developed a healthy appetite for the unexplained by watching far too many episodes of In Search Of hosted by Leonard Nimoy after school instead of doing his homework, which turned him into a reader of books on the strange and unexplained. He earned a BA in English from Southern Connecticut State University. Kirsten Dalley has functioned in various editorial capacities at New Page Books since 2004. She is coauthor of The Nightmare Encyclopedia, along with Jeff Belanger. She graduated from Columbia University with a BA in comparative literature, which has proven to be of use in both her career and her leisure pursuits (reading fiction and riding sportbikes). Stanton T. Friedman is a nuclear physicist who worked on a wide variety of advanced, classified nuclear systems for major industrial companies. He began the civilian investigation of the Roswell Incident; wrote Flying Saucers and Science and TOP SECRET/MAJIC; and coauthored Crash at Corona, Captured! The Betty and Barney Hill UFO Experience, and Science Was Wrong. He has appeared on hundreds of radio and television programs. Friedman resides in Fredericton, New Brunswick, Canada. Erich von Däniken is arguably the most widely read and most-copied nonfiction author in the world. He published his first (and best-known) book, Chariots of the Gods, in 1968. The worldwide bestseller was followed by 40 more books. His works have been translated into 28 languages and have sold more than 65 million copies. He lives in Switzerland.